Blockbuster (BBI) said Thursday that it expects to be delisted from the New York Stock Exchange after it failed to receive enough shareholder votes to authorize a reverse stock split. Meanwhile, the company won an extension from its senior secured noteholders after it said it wouldn't be able to make a payment on notes due Thursday. The "leading provider of media entertainment," as Blockbuster still calls itself, said that because not enough shares voted "yes" for the proposed reverse split and conversion of Class B shares, the proposal couldn't be approved. Back in November 2009, the NYSE warned Blockbuster that it could face delisting for violating the exchange's standard listing rules. Following the failed vote, the company said it now expects to be suspended from the NYSE next Wednesday. The specific NYSE rule that Blockbuster is failing to comply with relates to stock price: The exchange requires the average closing price of a listed security to be no less than $1.00 per share over a consecutive 30-trading-day period. BBI shares have been under $1 for quite some time now. And with Blockbuster closing Thursday at 23 cents a share, it's hard to imagine how the company would manage a price jump that would bring it back into compliance. It got worse on Friday, as the shares tumbled 20% in early trading. As for the company's debt, Blockbuster said it had struck a forbearance agreement with creditors holding about 70% of its 11.75% senior secured notes due 2014. The creditors agreed to hold off from exercising certain rights on the missed payments until Aug. 13. By taking this action, Blockbuster will preserve $42.4 million in incremental liquidity, an amount just slightly below the company's total market cap of about $47 million. Can this extension keep Blockbuster afloat? According to Reuters, the company has about $920 million in total debt and it has struggled to cover its interest payments. Six more weeks of grace are unlikely to make much of a difference for a company that is expected to earn less than $100 million this year before interest, taxes, depreciation and amortization -- even if CEO Jim Keyes says Blockbuster is "making progress in our recapitalization efforts." After these payments, the company is set to continue to lose money as it has the past few years. Since 2007, the company has lost $1 billion. "The agreement provides us with additional time and flexibility as we continue to take steps to implement a more appropriate capital structure to support the company's strategies for long-term growth," said Keyes, whose contract was recently extended by Blockbuster's board. 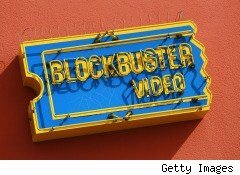 The troubled video rental chain, which has talked of bankruptcy several times, has struggled in recent years to deal with increased competition from Web-based service Netflix (NFLX), kiosk DVD rental upstart Redbox (CSTR), on-demand TV services and Internet sites.